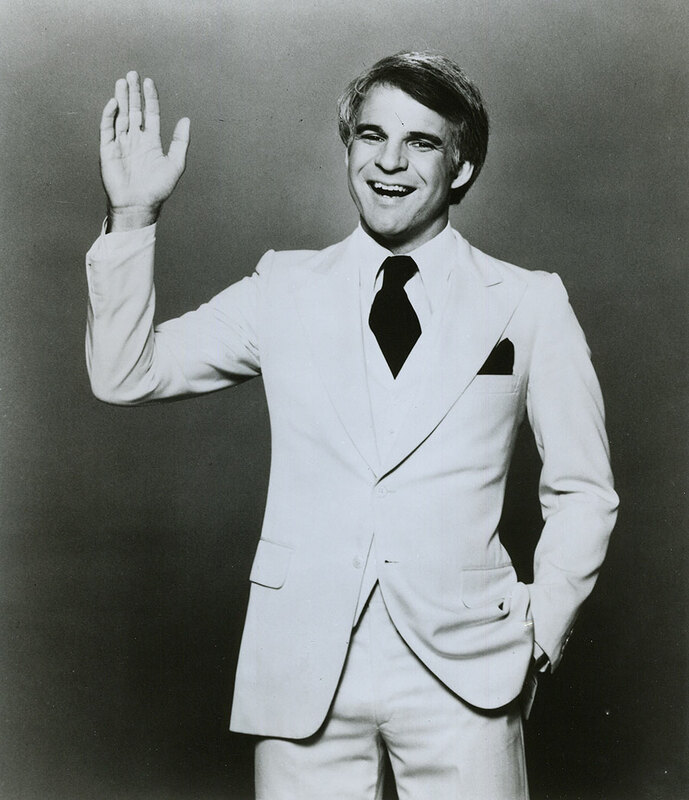 Growing up in Southern California, Steve Martin first picked up the banjo when he was around 17 years of age. He learned his way around the instrument with help from high school friend John McEuen, who later joined the Nitty Gritty Dirt Band. McEuen’s brother William later managed Martin as well as managing and producing several early Nitty Gritty Dirt Band albums. Martin exploded onto the comedy scene in the mid 1970s, and the banjo was a staple of his stand-up career. The young comic performed at Tulagi in Boulder and Ebbets Field in Denver, most memorably at a 1974 New Year’s Eve concert during a blizzard; after the show, he led the entire audience across the street and ordered 300 doughnuts, then changed his order to one cup of coffee. In 1974, Martin discovered the charms of Aspen and found a solar-heated home in the mountains to be closer to his friends the McEuens and members of the Nitty Gritty Dirt Band. By 1978, the Colorado resident was the most successful concert draw in the history of stand-up, earning the level of commercial success usually reserved for rock stars. The second side of his comedy album A Wild and Crazy Guy was recorded at Red Rocks Amphitheater in front of more than 9,000 roaring fans; they got treated to a rare on-stage appearance of Yortuk, one of the Czech Festrunk Brothers (the “two wild and crazy guys” he’d popularized with Dan Aykroyd on Saturday Night Live). A Wild and Crazy Guy reached #2 on Billboard’s Pop Albums Chart. It was eventually certified double platinum and won the Grammy Award in 1979 for Best Comedy Album. A Wild and Crazy Guy contained the hit novelty single “King Tut,” performed by Martin and the Toot Uncommons (actually members of the Nitty Gritty Dirt Band). Produced by William McEuen at his Aspen Recording Society studio, it paid homage to the boy king who “gave his life for tourism,” Egyptian pharaoh Tutankhamun; the “Treasures of Tutankhamun” traveling exhibit toured seven United States cities from 1976 to 1979 and attracted approximately eight million visitors. “King Tut” sold over a million copies and reached #17 on the Billboard Hot 100 chart in 1978. Martin also performed it on Saturday Night Live.